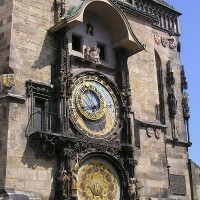 The unique astronomical clock shows Babylonian, Old Czech or Star Time. Let´s find out what indicates them. 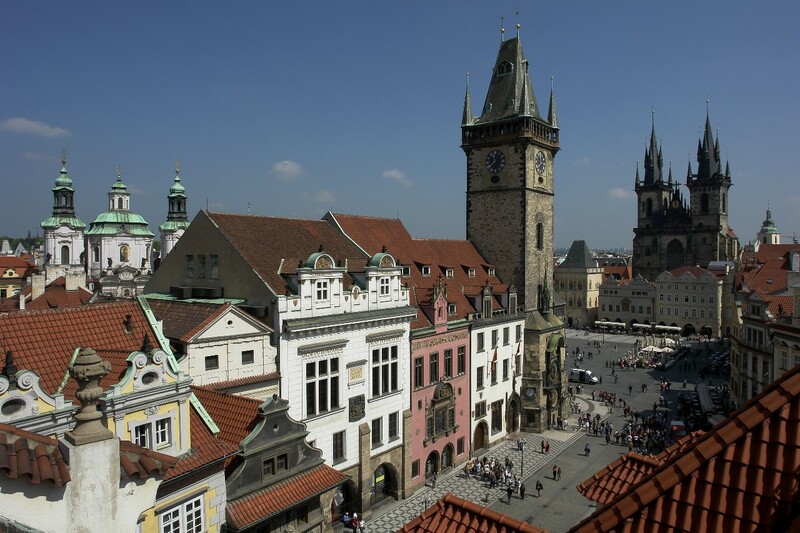 Old Bohemian Time, when the new day started with sunset, was understood by our ancestors. They also used to call it Italian hours. It is indicated by gold Gothic numerals on the outer ring - the twenty-four-hour dial. The golden hand also shows this time. Using a special mechanism, the twenty-four-hour dial travels around the clock during the year, as the time of sunset changes. Also called unequal or Arabian time, it was calculated only from sunrise to sunset. It is indicated by the simple black Arabic numerals 1-12. The intersection of the solar pointer and the ecliptic circuit shows Babylonain Time. The fanned golden line on the astrolabe's blue sphere comprise the Babylonian Time clock-face. The hour number is next to each line. 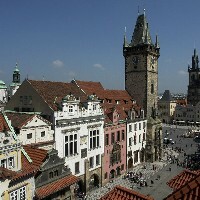 It is shown by the sun hand or pointer, which is the Astronomical Clock's most distinctive indicator. It is quite understandable to us today. Today the clock strikes Central European Time (CET), not Old German Time, which would be 2x 12 strokes. The twenty-four strokes are a holdover from a time when it struck Bohemian Time, 1 - 24 o'clock. Also called sidereal time, it is shown on the Roman numeral dial. It is derived from the apparent movement of the stars caused by the Earth's rotation. A sidereal day is shorter than a solar day.. It is the outermost concentric circle on the astrolabe, which reflects the fact that it is the northernmost parallel in the Northern Hemisphere, where the Sun is at the zenith on the summer solstice at true solar noon. It is located in the lower part. It shows the day of the week and its position in the week, month and year. The ring with the signs of the Zodiac depicts the path of the Sun and Moon through the sky. The center of the Zodiac is offset from the center of the astrolabe and the ring's perimeter touches the Tropics of Cancer and Capricorn. The golden hand on the twenty-four-hour dial (with Gothic numerals) shows Old Bohemian Time and European Central (or Old German) Time on the Roman numeral dial, where the day begins and ends at midnight as is common even today. 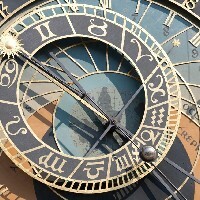 If the golden hand is covered by another part of the astrolabe, time can be determined in the extension on the other side of the clock-face, where the numbering is identical. The first hour is at the bottom, thus noon at the top. At other hours, it is the opposite. This is the smallest concentric circle depicted on the astrolabe. It is the southernmost parallel in the Southern Hemisphere, where the Sun is at the zenith at true solar noon on the winter solstice. 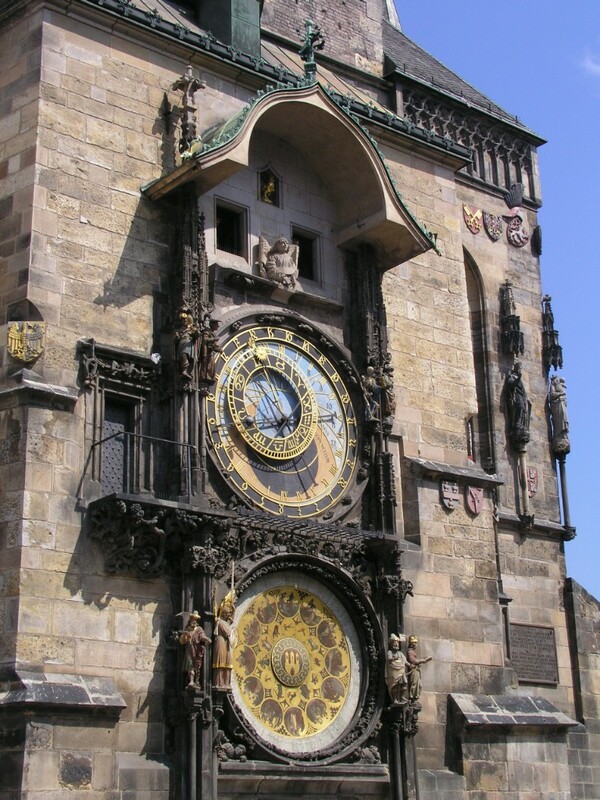 It is the cornerstone of every medieval astronomical clock. It is an astronomical instrument whose origin dates to Classical Antiquity. It was used to determine the positions of the Sun, Moon, and stars. It was important to astrologers and mariners. It also served to determine local time and was used in navigation. The astrolabe's appearance: It is a large brass or copper circle, whlch is comprised of two circular discs held together in the centre by a pin. The Body of the Astrolabe: The upper blue part of the sphere represents the sky above the horizon. The sun pointer is there during the day. The lower part of the sphere represents night, with part of dawn (Aurora) and sunrise (Ortus) painted red on the left, and sunset (Occasus) and nightfall depicted on the right. 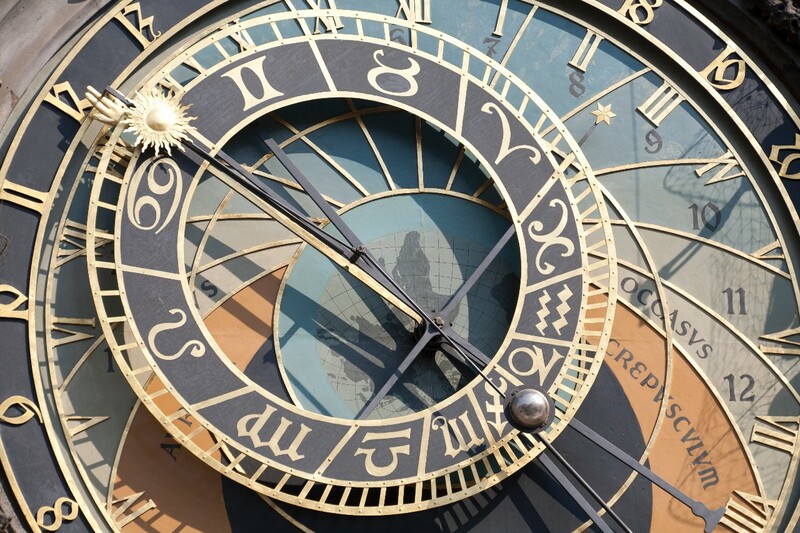 On the perimeter of the astrolabe is the twenty-four-hour dial - a moving ring with Arabic numerals where the golden hand tells Old Bohemian Time. Roman numerals are denoted below it. The Earth is depicted in the center of the astrolabe. Additionally, there are two concentric circles there: the Tropic of Capricorn and the Tropic of Cancer. There is an unmarked equator between them. The moon is a hollow ball with a helix and weight inside. As the hand with the moon travels around the dial, the weight forces the ball to rotate around its axis. One half of its surface is silver, the other black. The Moon thereby waxes and then wanes just like it does in the sky. It revolves all the way around the hand in twenty-nine and a half days, i.e., from full moon to full moon. Portraying the phase is the second feature of the moon. The first is to depict the Moon in the correct position on the ecliptic. The sun is located on the same pointer as the golden hand showing the time. The sun hand travels around the astrolabe once every 24 hours. The position of the sun, or the intersection of the solar pointer and the ecliptic Circuit, shows Babylonian Time.